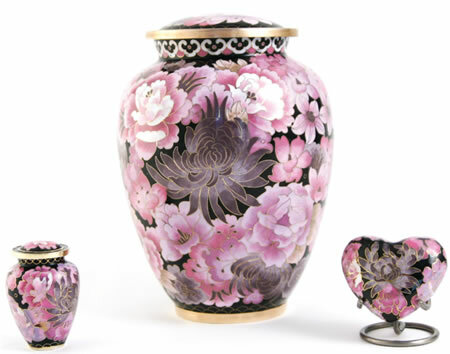 The Traditional Floral Blush Cloisonne Cremation Urn is created using an intricate metalworking process and multiple layers of fired enamel over copper or brass. Each urn is individually hand-crafted so each urn will be unique in design and coloring, making every urn a work of art. 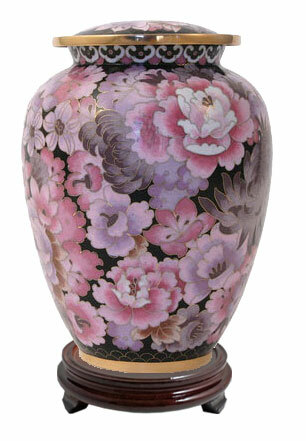 The coloring on these urns tends to be shades of pink with possibly some lavender. The large urn and matching keepsake have threaded lids. The heart keepsake has a threaded closure on the underside. These are not sold as a set. The Large Urn, Heart Keepsake, and Matching Keepsake are sold separately. Please select the size you wish to order. As with any urn, cremains should be kept in a sealed plastic bag inside the urn or keepsake. The large urn measures 9.5"(H) x 7"(W) and holds 200 cubic inches. 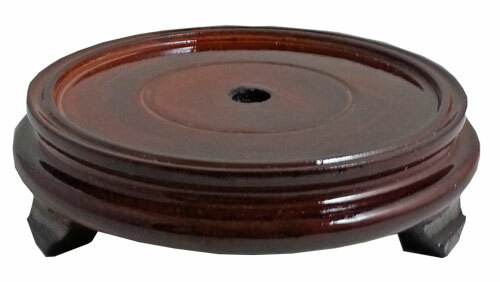 Large Urn comes with separate wood base, shown. Usually ships the next business day after order is placed. Ships from the Midwest.